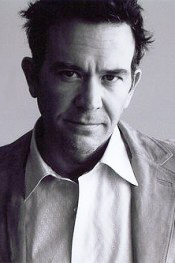 Timothy Hutton got the world’s attention in 1980 when he won the Academy Award as Best Supporting Actor for his role as Conrad Jarrett, a youth recovering from a failed suicide attempt, in Robert Redford’s directorial debut, Ordinary People. In fact, this all happened before is 20th birthday. Over 25 years later, the talented, blue-eyed Hutton has compiled an impressive acting resume from stellar performances on the big and small screen. He has starred opposite an impressive array of fellow leading actors, like John Travolta (The General’s Daughter), Sean Penn (The Falcon and the Snowman), Johnny Depp (Secret Window) and Nick Nolte (Q & A), as well as beautiful and gifted actresses like Meg Ryan (French Kiss) and Natalie Portman (Beautiful Girls). Hutton has also had an extremely successful career in television, directing, producing and starring in the popular series, The Nero Wolfe Mysteries, and is currently starring as Conrad Cain in the new NBC-TV drama, Kidnapped. Hutton’s creative passions do not end when the cameras stop rolling, and they are certainly not limited to the entertainment industry. He has a love for food and a love of New York, and those combined interests spurred him to purchase the landmark watering hole and restaurant, PJ Clarke’s. Along with his partner, restaurateur Phil Scotti, Hutton is taking the century-old institution to new heights and carrying on an over 100-year tradition. P.J. Clarke’s has been dispensing its own special brand of atmosphere, food, and drink since the late-1800s in the same location, 915 3rd Avenue in the heart of New York City. You can’t miss the little two-story red brick building surrounded by the towering skyscrapers that dominate the area of 55th Street and Third Avenue in midtown Manhattan. The restaurant stands as a genuine reflection of New York history and Hutton plans to keep it that way. I sat down with Hutton at the old oak bar of PJ Clarke’s and spoke about his latest role as restaurateur. When did you first become aware of the importance of good food? When I ate at my grandparents’ house. My grandmother loved to cook. She would lay out these wonderful, elaborate meals that were pleasing to the eye as well as the palate. One of my grandmother’s favorites that she prepared was rack of lamb, with roasted potatoes and sautéed asparagus. For dessert I would enjoy her amazing flan. Have there been any food themes in any of the movies you have acted in? I have been in many movies with food scenes. I produced a show for A&E called “Nero Wolfe,” a famous fictional detective created by Rex Stout. A lot of what “Nero Wolfe” was definitely about was his love of fine food. “Nero Wolfe” gets paid a lot of money to solve these cases and he spends it all on a gourmet chef and enjoying great luxury. He has a master chef living in residence and traditionally there are huge four-course meals for lunch and seven to eight-course dinners. What was the most unique characteristics about “Nero Wolfe” related to food that attracted you to do the series? For one thing, he had 289 cookbooks in his Manhattan townhouse. Also, in “Nero’s” townhouse, there was a collection of antique cooking vessels, one of which was thought to have been used by Julius Caesar’s chef. You have acted in various movies shot overseas, such as “French Kiss,” where you played opposite Meg Ryan and Kevin Klein. How is the food in Paris? The food in Paris is amazing. Actually, my wife Aurore, is from Paris, so we spend a lot of time there. Her family is all about fine cooking and eating. Not only do I think it is one of the best dining out cities in the world, I also think it is a great place to eat in someone’s home. What is your favorite restaurant in Paris? My favorite restaurant in Paris is actually a Chinese restaurant called Tong Yen. It is the probably the best Chinese food I have had anywhere. In between movie roles, when you are home, do you do a lot of the cooking for your family? I do not cook often. I leave it up to my wife, who is a great cook. My wife makes a great lasagna, an unbeatable Shepherd’s pie and I love her homemade guacamole. When we go to our summer home in Upstate New York, she usually prepares a wonderful French lunch laid out on a large platter. It consists of 10 kinds of French cheeses, gherkins, meats and olives. Living in New York City, with so many great restaurants available, which ones do you like to frequent? When I am uptown, I love to eat at Henry’s, where I have their steak frites. When I am downtown, I eat at the Italian restaurant, Bussola. When my family and I want to stay home and my wife and I do not feel like cooking, I order take-out from the Italian restaurant, Carmine’s. I usually eat their caesar salad, spaghetti with garlic and olive oil and their meatballs, which are amazing. We also love to eat at the restaurant I’m a partner in, P. J. Clarke’s. What inspired you to buy into this New York City landmark restaurant, which was originally built in the late 1800’s? I always loved P.J. Clarke’s, going back to when I was very young. I remember eating at P.J.’s with relatives when we would travel to New York City from Boston. When I moved to Manhattan in my early 20s, I would go there a lot. It’s especially a great place to end a night on the town or a great place to start a night. I just get a really good feeling when I walk through the doors and I think a lot of people feel the same way. When you come back from a trip and you are on your way from the airport, instead of going straight home, you tend to stop there first. If you leave a little early for the airport, you stop there first, too! It looked like this restaurant was going to close down, but the opportunity came along to join restaurateurs Arnold Penner and Phil Scotti to buy it. What major addendums did you make on the menu? We added some exciting seafood dishes to the menu. For starters, there’s now a raw bar with stone crabs, clams and shrimp that has been very successful. A new seafood sampler includes a one-pound lobster, little neck and cherry stone clams, oysters and shrimp. We have added daily specials such as lasagna on Sundays and meatloaf on Thursdays. How about the wine list? We wanted to have a place that feels and looks like old New York and, then, secretly, houses one of the best wine lists in the whole city. We have a huge upgrade from the old P.J. Clarke’s wine list. What makes the legendary P.J. Clarke’s hamburger, which is loved by many stars, taste so good? The meat that’s used is simply the finest quality meat that money can buy. It is not the usual stock hamburger meat that is made into patties as in most restaurants. What our chefs do is take the finest possible steak and grind it into hamburger meat right on the premises. When you eat at P.J. Clarke’s what are your favorite things to eat? I like the iceberg lettuce salad. I also love the cheeseburger and the beef barley soup. I always come in on Sundays and have our lasagna special, which is amazing. It would have to be Guinness.